Are you looking for a way to get involved in the Vancouver and Whistler community? Good at cheering and spreading smiles? Want to give back to the cycling community? 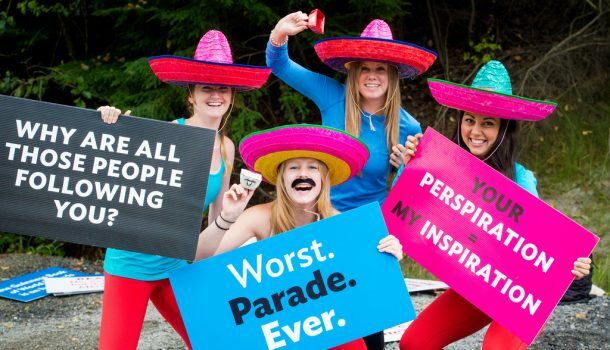 Join us as a volunteer at the 2019 RBC GranFondo Whistler! Squadra is the backbone of the entire event every year, and it simply wouldn’t run without the hard work, smiles, and dedication of our 500+ volunteers. Volunteer registration is officially open for the 2019 season! We have positions from Stanley Park all the way to Whistler along the beautiful Sea to Sky highway. Always come prepared to events with a full water bottle and some basic snack items for yourself. We will provide snacks and refreshments, but the timing might not fit with your growling stomach. If you’re not fully comfortable with a given task or role, please don’t hesitate to speak up and ask. You have the full obligation to voice your concerns and should ask for clarification when needed. Whether it’s the heat, heavy lifting or a disgruntled rider, please let your Event Captain know so that the situation can be dealt with as soon as possible. Arrive on time for your shift having fully read all the materials that have been provided. Arriving fully informed and prepared will add to the enjoyment of your experience as you will be able to directly answer any questions with confidence.